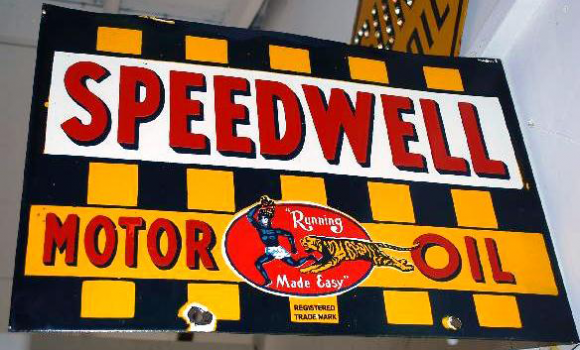 Large sign for Speedwell Motor Oil. This sign uses vibrant colors. The word “Speedwell” is written in bright red with a subtle black shadow behind it. At the bottom of the sign are the words “Motor Oil.” The only thing separating the lower words is an image of a man running and a tiger pursuing him. The rest of the background of the sign is a black and yellow checkered flag.